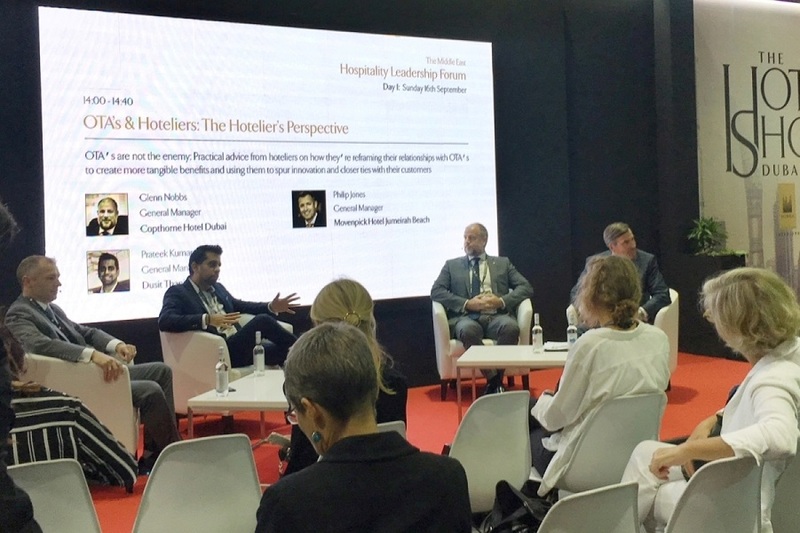 Nobbs shared his opinion in a panel discussion at The Hospitality Leadership Forum, a central feature of The Hotel Show held at the Dubai World Trade Centre from 16 to 18 September 2018. He and other industry speakers debated on the topic “OTA’s & Hotelier: The Hotelier’s Perspective”. All of them acknowledged that OTAs are an important source of business for the hotels because they can reach new guests and access new markets, particularly due to their multi-billion dollar advertising spend across the globe. In fact, it would be very difficult for hotels to compete effectively against OTAs. “However, we have direct control on the guest experience once they bring the customer to us so it’s our responsibility to manage that relationship and make sure the guest comes back directly to us through our brand’s website next time,” explained Nobbs. When questioned about the reliance on OTAs as a key source of business, the panel was quick to point out that only about 30 to 35% of total hotel bookings come from OTAs, and that they represent only one segment of a Hotel’s business. Therefore the emphasis remains on the Hotel sales team and executive management to ensure they correctly price and sell the remaining 65% across other segments to achieve their revenue targets. “With dynamic rates now across Wholesalers and Travel Agents, it is also very important that we ensure we price correctly at the right time and maintain price parity with all of our partners,” he noted. It was also shared that exposure on OTAs can help increase direct bookings due to the customer moving from an OTA to Hotel brand site to complete the booking process once they have identified the Hotel. “We just need to strategize continuously, learn from the available booking pattern information in the OTA’s extranet, and keep improving our guest review ranking to maximize our revenue potential on a daily basis,” added Nobbs. The Hospitality Leadership Forum is a series of spontaneous and forthright panel discussions and interviews on the key strategic opportunities and challenges shaping the regional sector.